Yes, I sewed again. =) I just can't help it! I'm wanting to make a few long skirts for the fall/winter, and I made the first today. It took a little while to do all the gathers, but it was entirely worth it! I so enjoy tiered skirts. They are so pretty, feminine, modest, comfortable, and fun to wear. What more could a girl want? I can't wait to wear it tomorrow! You did a wonderful job, Anna! I've been wanting to make a skirt like that so bad, but there's no way I could have the patience to put in all the ruffles! Can't wait to see it tomorrow! Wow! It's beautiful, Anna. I just have to have your pattern. I love tiered skirts! Yours turned out very pretty. 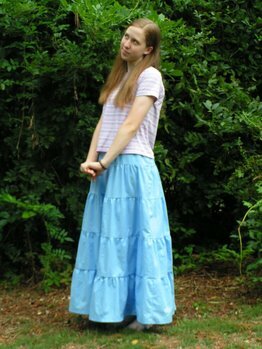 I have a denim tiered broomskirt that I love. Since I don't have a pattern for one like it, I just measured each of the tiers on my denim skirt and then copied the pattern to make a warm winter skirt out of some faux wool type material. Fun! I have had more compliments on that skirt than any other I own :). Wow! Miss Talened! I wish I could do that. I own skirts like that, but they are all store-bought! Thanks girls! I didn't think I'd want to sew all the ruffles either, Samantha, but they went surprisingly fast. I knew you'd ask for the pattern, Miriam! =) I'm going to make one more skirt out of a different pattern in the package, then I'll let you borrow it. I thought of simply copying the denim tiered skirt (we have the same one, remember!) and making one like it, but I found a cheap pattern that has different styles, so I decided to get it. I have a store-bought one as well, Ella, but haven't gotten any more since I realized that I could sew ones I liked more for less money! Anna, could you maybe give me the name/link of the pattern you used? I want to start to sew some of my own clothes, and just LOVE tired skirts! In fact, I just bought a denim tired skirt and a white eyelet tired skirt! I love them both! Skirts are so comfortable and modest! I just feel like a princess wearing them! Charity Grace: I found the pattern at Walmart. It's called New Look, and is number 6565. Yes, tiered skirts make me feel like a princess as well! I'm glad you all enjoyed the picture! Is this pattern fairly easy? Yes Kay, it's quite easy. I think it was the second thing I sewed on a machine. It's really good for a beginner (which I was!). Anna mentioned where to find the pattern up above. Welcome to our blog! How did you find our blog?